Remember when you learned about mitigation banking in your environmental planning course? Well, now you can see what a mitigation bank actually looks like! Come join us for a tour of Petersen Ranch. The Petersen Ranch Mitigation Bank (“Bank”) consists of two sites in unincorporated Los Angeles County: the approximately 4,000 acre Petersen Ranch near Leona Valley and the 300+ acre Elizabeth Lake site located within the Congressional boundaries of the Angeles National Forest, on the shores of Elizabeth Lake. 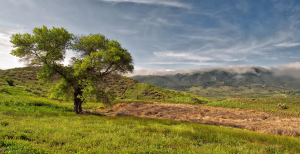 Petersen Ranch is the largest mitigation bank in California and the first mitigation bank in Los Angeles County. Target resources include: wetland and riparian habitats; desert wash; alluvial floodplain; oak & juniper woodlands; native grasslands; mixed chaparral; and scrub communities. The Bank also contains foraging habitat for Swainsons Hawk, and potential habitat for Burrowing Owl, Coast Horned Lizard, Golden & Bald Eagle and other sensitive species. Purchasing mitigation credits through an approved mitigation bank allows landowners, including cities and agencies, to pay a one-time fee and thereby eliminate the time, frustration and risk associated with applicant-sponsored mitigation. Tracey Brownfield has over 30 years experience in land acquisition and entitlement, finance and real estate development. She co-founded Land Veritas in 2010 to acquire resource rich and infill properties. Land Veritas owns over 4,600 acres of land in southern California, including the largest mitigation bank in the state of California. Julie Vandermost Beeman is the owner of VCS Environmental, a 15-member WBE/UDBE/SBE firm located in San Juan Capistrano specializing in the preparation of California Environmental Quality Act (CEQA) and National Environmental Policy Act (NEPA) documents, biological flora and fauna surveys and reports and regulatory permitting related to waters of the U.S. and State, including wetlands, endangered species and water quality. With 30 years of experience working with regulatory agencies on mitigation banking and other projects, Julie is able to provide an insiders view of the nuts and bolts of mitigation banking. Parking/Transit Information: We’ve limited this event to 20 attendees, per the request of their staff. Vehicles used to tour the site must be 4-wheel drive, so we will be renting vehicles as needed and requesting that some attendees be willing to drive. We’ve built some drive time into the event schedule. As we get closer to the tour date, we will firm up travel and logistics information with attendees. Lunch will be provided.